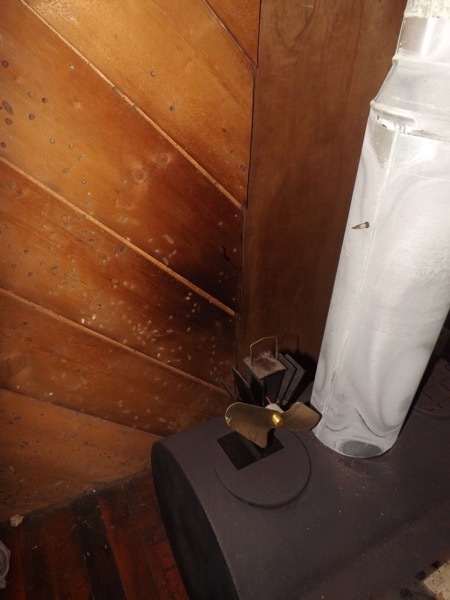 After we incorporated homemade heat shielding into our water heater install (see An Alarming Debut) we turned our attention to another problem on the homestead: the wood stove in the cottage. We’ve made fires in the cottage wood stove for years without thinking much about the stove’s proximity to the adjacent wall. I confess, we installed a new stove in place of an older one, matching the proximity to the wall, and didn’t worry much about the difference. Before: We obviously had a problem. Note: holes in wall come from the toredo worm wood used as decorative paneling (Photo: Sarah A. Zeiger). While I have been staying over at the cottage for several months now, it’s been more like camping, because I’ve slept on the guest mattress that’s lived over there for many years. At the end of October, we changed that. We dismantled my homemade bed frame from the cabin for reuse in the cottage. 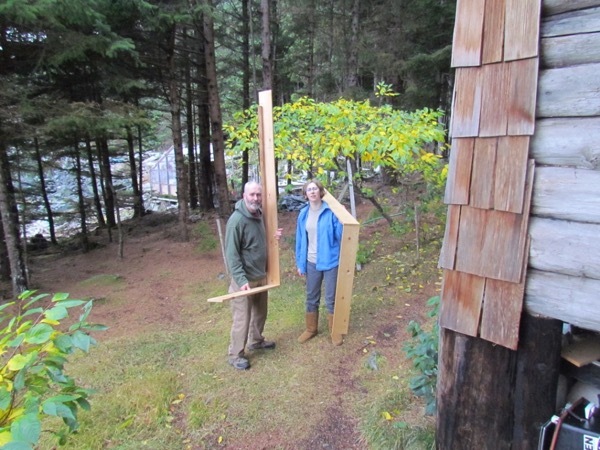 Dad and I disassembled the bed and hauled the frame pieces to the cottage (Photo: Michelle L. Zeiger).